A few years ago, I was talking with a teacher on my team, asking him how he coached students who struggle with word problems. His toolbox of problem solving pedagogy boiled down to one sentence: “I tell them to read the problem again.” While it is vital to make sure students understand the problem, we can help them develop strategies for understanding word problems. Jennifer Wilson and Jill Gough recently presented at Texas Instruments’ T^3 Conference in San Antonio. 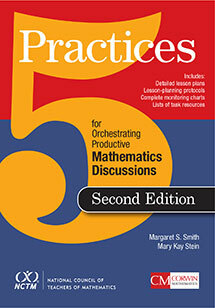 Their sessions did a great job of modeling 5 Practices for Orchestrating Productive Mathematics Discourse. They demonstrated how Anticipating (one of the practices) helps teachers plan how to get students “unstuck” as they work a problem. If teachers have already explored a problem, using all the avenues they expect their students to use, then they can recognize their students’ struggles and give them the smallest possible push to help them out of the struggle. Since the conference, I’ve focused on that “smallest possible push,” trying to make sure I trust students to continue the work, while helping them reach their goal. As math teachers, we often pick up the pencil for our students and never set it down again. Wilson & Gough modeled another great teacher move: as the participants worked through some geometry puzzles, they suggested we “add something to the diagram that isn’t there, yet.” It’s a gentle statement that gave us permission to do something to the problem, even if we weren’t sure it would move us toward the solution. Are we looking for a leg or a hypotenuse? When we are looking for a leg do we add or subtract? What do we have to remember to do with that answer? The students were doing the arithmetic, but the teacher was doing the math. The students moved on to the next problem, and repeated the procedure, with their teacher asking the same series of questions again. And again. As you can imagine, the line of students asking for help became long, so some students approached me with on of the problems. I drew the typical Pythagorean theorem model (a right triangle with squares attached to each side). I put down my pen and asked the students what they could add to the paper that wasn’t already there. I watched as the students talked and used the information in their problem to fill in the side lengths, the areas of the squares, the missing area, the missing side length. Without any further prompting. I watched this practice work 3 or 4 more times in the course of the class. Students activated their prior knowledge with limited coaching from me. It was encouraging that they were not frustrated by the practice. They didn’t cajole me to tell them what to do or just let them in on the answer. They were ready for this assignment, but needed some small pushes to get unstuck. The next day, I worked on the same topic with a group of 5 students with limited English proficiency. I tried the same strategy with the whole class. This time, the students had the word problem printed in front of them, and I drew the Pythagorean model on the dry erase board. I invited the students to add one thing to the diagram, then pass off the marker to someone else. It was delightful to watch. At first, they were very procedural – labeling C and B, writing the Pythagorean formula. Soon they were placing values on the diagram. A couple of times, they would pause for about a minute. Then one of them would excitedly grab the marker, thinking of something to add. Invariably, this would give someone else an idea and they would add a new rush of information.